Cupar is a charming medieval market town surrounded by glorious countryside and an abundance of local wildlife. It is a lovely place to visit and to live, with a wide variety of idyllic venues in which to host events and celebrate life’s milestones. Here at Hog Roast Cupar, we feel very privileged to be able to provide catering services in such a beautiful part of Scotland and we love being able to offer our clients the freedom to choose any venue they wish, whilst still being able to eat delicious food. The Hog Roast Cupar team can provide an elegant menu for a country park wedding or a hearty feast for a medieval themed banquet in the market square with equal success. Our carefully designed and imaginative menus provide modern touches combined with traditional cooking methods and both exotic and classic flavours to suit all tastes. As well as the traditional hog roasts we are so well known for, we also offer a variety of alternative meats, including sirloin of beef, organic chicken, spring lamb and whole roasted Scottish salmon, as well as canapes, starters and desserts, all freshly prepared by our skilled Chefs at your venue. 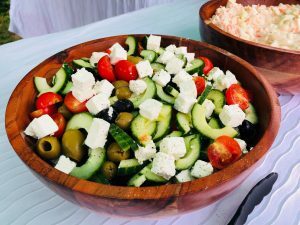 We also take into consideration different dietary requirements and we have an impressive choice of vegetarian dishes, nutritious salads and gluten free substitutes. We strive to give just as much time and attention to our alternative menu options as we give to our perfectly-cooked slow-roasted pork, to ensure everyone guest feels included and enjoys the food as much as the meat-lovers in your party. All of our ingredients are carefully selected from ethical local suppliers and we are very lucky to have such a fantastic range of homegrown produce available to choose from in Cupar. The area has certainly earned its nickname of ‘nature’s larder’ and we take full advantage of everything it has to offer when choosing our ingredients and planning our menus. The quality of our ingredients and our commitment to freshly preparing all of our dishes from scratch on-site makes Hog Roast Cupar stand out from the crowd when it comes to mobile catering in the area and it is something we always get great feedback about from our happy customers.